After you have created your website with iWeb, you need to know how to upload a iWeb website to our servers. 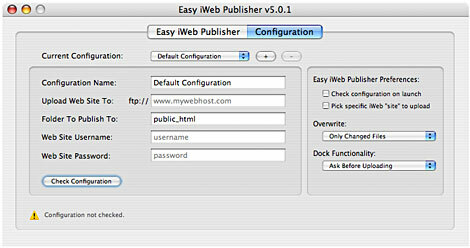 Download a copy of Easy iWeb Publisher here. 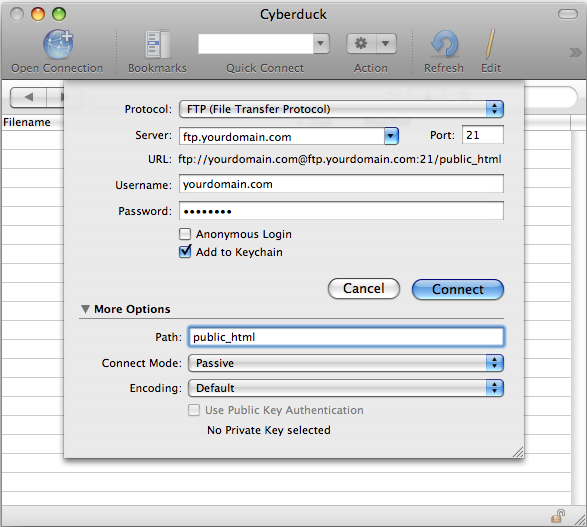 Get a copy of Cyberduck (Free FTP program). Under the file menu in iWeb, choose to “Publish to Folder” and publish to a new folder (one with nothing in it yet, probably on your desktop so it’s easier to find later). Open Cyberduck >; Open Connection. In the “Username:” enter you domain name. In the “Path:” enter “public_html”. Click “Connect” (it should open at the root level of your hosting space, which is where you want to upload your iWeb site). On your computer, select all of the files and folders inside the folder you published your iWeb site into and drag and drop them into the Cyberduck file window. After the files/folders finish uploading, use your web browser to check and make sure your site is online and working. To update/add to your site, the easiest, and most consistent, way is to make your changes in iWeb, and then repeat the above steps (i.e., republish the whole thing); this should avoid updating only some of the files that make up your site. Cyberduck will keep your settings for the next time you upload (if you ticked “add to keychain”) using this drag-and-drop method. when i open the connection in cyberduck, there are files which automatically appear in the window before i drag and drop what i want there. Why does this happen, is it wrong, should i delete these files and then drag and drop? The files you see are the existing web site files already on the server. To be on the safe side yes, you should replace all the files with the site folder files on your desktop. Deleting them first would ensure that your site has no stray files left on the server, but would make the upload process longer. Alternatively you can drag and drop all the new site files/folders and Cyberduck should prompt you of any duplicates so they can be overwritten. You’re best talking to support about FTP connection issues. They will sort this out for you.